The FBI has conducted two interviews and may schedule a third with the woman who walked out carrying classified documents from what's supposed to be one of the most secure facilities in the world, the Los Alamos National Laboratory, CBS News has learned. The incident has exposed continuing security weaknesses at Los Alamos, which has been the focus of security and management scandals for seven years. Sources say 22-year-old Jessica Quintana was hired to archive data from weapons tests, and even had access to information on how to deactivate the locks that keep nuclear weapons from firing. Somehow, she managed to leave the laboratory with hundreds of pages of classified documents and several portable computer storage devices known as "thumb drives." As CBS News was first to report, the materials were found by accident in October during a drug raid on Quintana's roommate at their trailer home. Now, a chief watchdog of the Laboratory, Rep. Ed Markey of the House Energy Committee, plans to fire off a scathing letter to the Energy Secretary demanding answers. "These are secrets that could be valuable to al Qaeda," Markey tells CBS News. "Our enemies want to have access to the most dangerous technologies to hurt our country. [The Laboratory and the Department of Energy] keep promising they're going to put better security measure in place, but they never do." In his letter addressed to Energy Secretary Samuel Bodman, Markey outlines years of high-profile security breaches at Los Alamos, followed by promises from the Energy Department and lab officials to tighten the ship. That includes weapons design information being obtained by the Chinese in the late 90s and missing computer hard drives or similar materials in 2000, 2002 and 2004. The security breach in 2004 led to a temporary complex-wide shutdown of the laboratory that cost taxpayers at least several hundred million dollars, according to the Department of Energy. The Department of Energy's Inspector General, Gregory Friedman, recently weighed in with his own criticism over the latest security breach, calling the laboratory's security "seriously flawed." "Monitoring by both Laboratory and Federal officials was inadequate," Friedman reported in his findings. He called the latest incident "especially troubling" since taxpayers have spent "tens of millions of dollars" upgrading security at the laboratory in recent years after other security breaches. A spokesman for Los Alamos tells CBS News that after the October security incident, many new security measures were installed. These include disabling the ability to download classified materials to unauthorized electronic devices and banning computer memory devices in certain areas. However, an official with the Department of Energy tells CBS News he thought those measures had been taken long ago. Rep. Markey echoes that, saying Congress was promised in prior hearings that such steps were being taken — but "apparently they weren't." 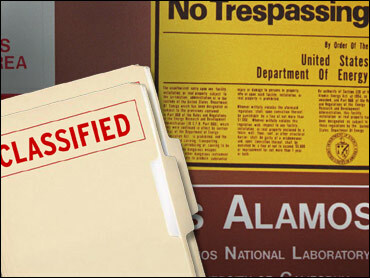 Tune in to the CBS Early Show Wednesday at 7 a.m. for an exclusive report on the investigation and just how easy it was for the Los Alamos employee to slip out with classified documents.